I really like these styles of dress. 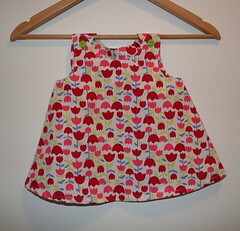 Once they are too short to be dresses anymore they can be worn as tunic tops. They are both different views of Butterick 4784, dated 1987. I picked up the pattern from the op-shop for 50c a few months ago. 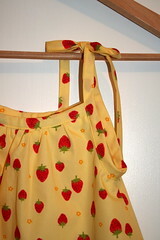 The yellow strawberry dress is made from Japanese fabric that a friend brought back for me from Kyoto. The tulips fabric was on the sale table at Spotlight a few weeks ago (I love $4/m fabric!). 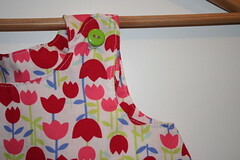 Because I already had the fabric in my stash, the only thing I needed to buy was the cute lime green buttons for the tulip dress. Apologies for the bad light in the photos. I took these at night just before I wrapped them up. 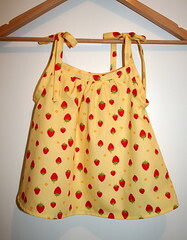 The strawberry dress, with all that homemade bias, was a bit fiddly to make, but I whipped up the tulip one pretty quickly. I'm planning to slightly tweak the pattern and then make some more of the tulip style ones and put them up in the shop in early January. I've now received all of my ornaments for the swap, plus a few bonus ones. Pictures tomorrow. What lovely sweet dresses! 1987- the year I was born. I mainly wore smocked frocks though- when I wasn't in trackies!! I've got that tulip fabric too! A spotlight bargain.